She’s young, she’s spunky, she’s a Chicagoan and she makes a mean Pomodoro sauce. Who am I speaking of? Well, that would be the lovely Jenna of Jennaseverthingblog.wordpress.com. On May 11th, she posted a recipe that caught my eye and made my tummy grumble. And I had just eaten. I knew when I saw it that I would have to try it. It’s her version of Pasta al Pomodoro, and if you’re a rabid pasta fan like me, you’re going to want to make it, too. 1. It’s incredibly easy to make. 2. It’s made with a handful of all-natural ingredients. 3. It packs a wallop of flavor you don’t get from jarred sauces. 4. It can be paired with every type of pasta – from bow-ties to lasagna. 5. I can make big batches of this and freeze it for quick meals. 6. It contains fresh basil. Everything is better with fresh basil. 7. It contains lots of fresh garlic. Everything is better with garlic. 8. It tastes better than any other pasta sauce I’ve ever eaten. Seriously. Nothing! This is my new go-to sauce. No more Prego for me, baby. So do me a favor. Jump over to Jenna’s blog and take a look at her step-by-step instructions, complete with full-color photos. If you’re not sold on this sauce, then I’m a monkey’s uncle. Which will be tricky, since I am neither a monkey nor an uncle. Now if you’ll excuse me, I need to go find an Altoid. Aw thanks! I’m so glad that you loved it! Oh, I loved it all right. I woke up thinking about having leftovers for breakfast! Thank you for sharing this one, Jenna. It’s outstanding. Sweet! I just remembered that we’re also TK buddies, so if you feel like rating it over there, it’s in the ole recipe box (I’m ‘kitchenlovenest’ over yonder). Happy to oblige, Jenna! It’s definitely a “5 mitt” recipe. Thanks for the reminder. I love the Tasty Kitchen website, and the new design format is gorgeous! Mmm…this looks delish! I love how quick it is to make and freezing it in batches for quick meals is a great idea! Thanks, Jennifer! Been there, left a comment for that! Your breakfast avacado recipes look stellar. Can’t wait to try them. I’m a lover of all things involving avacados. Boy, I can’t get enough pasta. I also haven’t been over to visit Jenna in awhile. All the more reason to make her pasta! #7 is my favorite. Fact: Garlic belongs in every dinner. Amen! Garlic makes everything better. And in the case of Jenna’s sauce, fresh basil is key, too. I’m getting ready to have a big bowl of leftover pomodoro for lunch today. So good. Well. I’m italian and I think I am the right person to give an opinion, hihihi :D I’m going to visit Jenny’s blog and tell you what I think of her Pasta al Pomodoro. I look forward to your opinion, Eleonora. You’re obviously more qualified to judge Italian food than I am. I should warn you, though, it will be tough to convince me that Jenna’s sauce is anything short of fantastic! Give it your best shot and let me know what you think. I always love to hear everyone’s take on recipes! 4:50am, and all I can think about is this dish. I’m suddenly starving… Looks and sounds DELICIOUS. 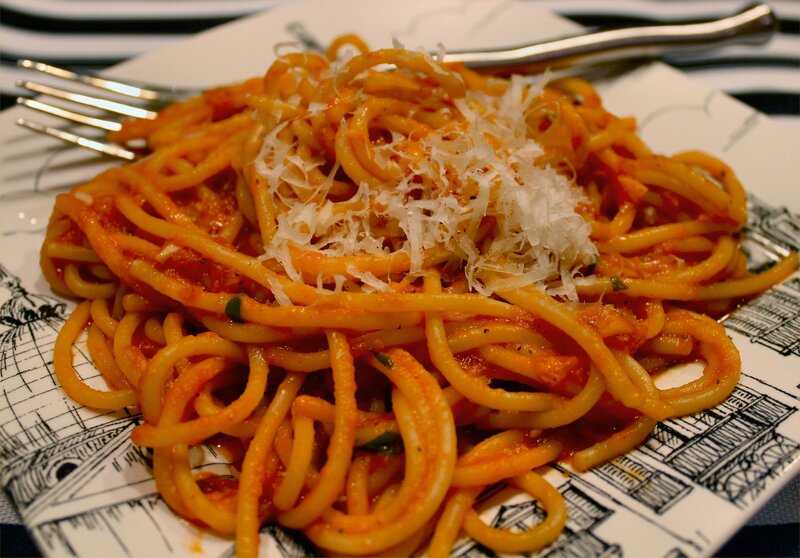 No one should be awake and thinking about pasta at 4:50am – pregnant or not! That said, however, I woke up at 7am the other day craving this for breakfast. It’s that good. Hope you got a nap in, Alex! Thank you for paying this one forward – in our house there’s nothing better than an easy, homemade pasta dish, you know? It keeps the balance of things in order. I’ll definitely be checking it out! Happy to, Kat! It’s a fantastic recipe. Simple, yet extremely flavorful. It’s definitely my new favorite pasta sauce. That Jenna is a genius in my book.